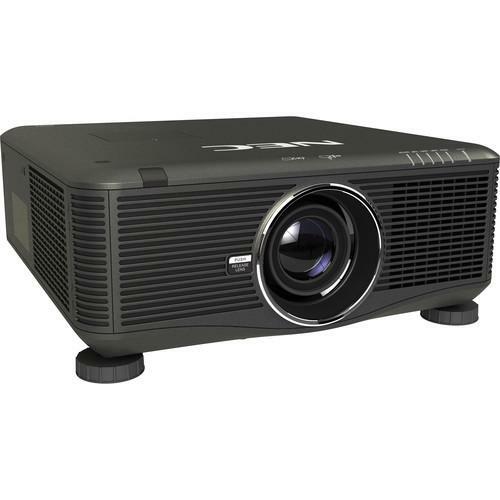 We recommend checking out our discussion threads on the NEC NP-PX700W2 7000 Lumen WXGA Professional NP-PX700W2, which address similar problems with connecting and setting up Multimedia Projectors NEC. The user manual for the NEC NP-PX700W2 7000 Lumen WXGA Professional NP-PX700W2 provides necessary instructions for the proper use of the product A/V Presentation - Projectors - Multimedia Projectors. Produce bright and detailed images with the NEC NP-PX700W2 7000 Lumen WXGA Professional Installation DLP Projector. This professional projector has dual lamps that deliver 7000 lumens of brightness and has a 2,100:1 contrast ratio. Additionally, the NP-PX700W2 sports a WXGA 1280 x 800 native resolution for viewing detailed content and supports up to WUXGA 1920 x 1200 video signals. This projector is powered by a DLP display system and features a long life of up to 2,500 hours in eco mode. You can use the NP-PX700W2 to project up to a 300" diagonal screen size, making it suitable for large venues. Furthermore, the NP-PX700W2 is compatible with a variety of interchangeable NEC lenses. With HDMI, DisplayPort, BNC component video, S-Video, and two VGA inputs, this projector is well equipped for a wide range of external video sources. There's also an OPS slot for expanded connectivity. As an added convenience, a VGA cable is included. A USB port is also onboard, which allows you to view photos. The NP-PX700W2 is also equipped with an Ethernet port for controlling the projector from remote locations. Other features include a 0.2W standby power consumption level, optional ceiling mount compatibility, and 64-step image magnification. If you own a NEC multimedia projectors and have a user manual in electronic form, you can upload it to this website using the link on the right side of the screen. The user manual for the NEC NP-PX700W2 7000 Lumen WXGA Professional NP-PX700W2 can be downloaded in .pdf format if it did not come with your new multimedia projectors, although the seller is required to supply one. It is also quite common that customers throw out the user manual with the box, or put the CD away somewhere and then can’t find it. That’s why we and other NEC users keep a unique electronic library for NEC multimedia projectorss, where you can use our link to download the user manual for the NEC NP-PX700W2 7000 Lumen WXGA Professional NP-PX700W2. The user manual lists all of the functions of the NEC NP-PX700W2 7000 Lumen WXGA Professional NP-PX700W2, all the basic and advanced features and tells you how to use the multimedia projectors. The manual also provides troubleshooting for common problems. Even greater detail is provided by the service manual, which is not typically shipped with the product, but which can often be downloaded from NEC service. If you want to help expand our database, you can upload a link to this website to download a user manual or service manual, ideally in .pdf format. These pages are created by you – users of the NEC NP-PX700W2 7000 Lumen WXGA Professional NP-PX700W2. User manuals are also available on the NEC website under A/V Presentation - Projectors - Multimedia Projectors.